The modified Gordon-Kim (MGK) electron-gas model for the calculation of the short-range repulsive interactions between closed-shell atoms and molecules is used with a damped-dispersion term of a form suggested by Hepburn et al. to calculate the intermolecular potentials between the rare-gas atoms and H,-He, H2-Ne, and H,-Ar. The damping function for the dispersion energies is found by comparison with the experimental Ar-Ar potential and is then used without change for all other interactions. Except for interactions involving Ne atoms, the results for the atom-atom interactions are uniformly quite good, with an average deviation from experiment in the position of the minimum (neglecting those involving Ne atoms) of only 0.7%. Both the radial Vo(r) and anisotropic Vz(r) terms of the atom-molecule results are compared with experiment. The calculated Vo(r) potentials for He-H, and Ar-H2 show close agreement with experiment, though the V2 terms are less well determined. All interactions involving Ne atoms are too repulsive. The errors in the potentials involving Ne atoms are attributed to errors in the treatment of the exchange energy in the MGK model. 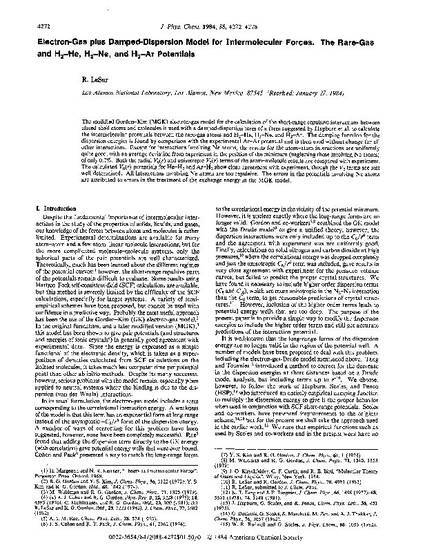 Reprinted with permission from Journal of Physical Chemistry B 88 (1984): 4272. Copyright 1984 American Chemical Society.